The space in block 46 is worth $5,000 because that block is an older monument block and has been sold out for quite some time. It is a single lot, approximately forty square feet. 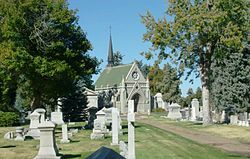 Fairmount Cemetery is the second oldest cemetery in Denver and is a beautiful perpetual care cemetery. About 15 feet from the lot is a beautiful old tree, like the one in the middle picture, which provides beauty and shade to the area. This older area contains huge mausoleums to smaller monuments and tomb stones and is pleasant to walk through and visit. I am asking $4500 for a quick sale; I now live in Canada and do not intend to return to the United States. My husband's monument is very nice, and this plot is located right beside his. Fairmount Cemetery has offered to talk to anyone interested in the lot, confirm its value and show the lot in question. You can contact Fairmount Cemetery - Seth Moser at 1-303-399-0692 Ext. 201 or contact Peter or Maralyn at 1-403-443-2206 for more information. Email us at pmdyck@gmail.com. You will receive a legal deed to the property once we conclude the selling arrangements through Fairmount Cemetery. Below are a few pictures of the cemetery.